Prerna is a licensed Clinical Psychologist. She obtained a Master’s degree in Psychology from the University of Delhi, India after which she completed her M.Phil in Clinical Psychology from the Institute of Behavioral Sciences, India. 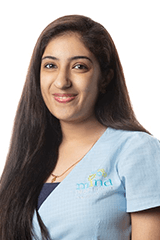 Prerna enjoys working with children, adolescents and families and has over 4 years of experience working as an independent therapist. She has extensive clinical experience in diagnosis and intervention of children with varied developmental and behavioural difficulties including intellectual delays, ASD, attention deficits and conduct issues along with problems of anxiety and mood. Her clinical practice involves focusing on the various behavioural, emotional and social needs of children, with flexibility in her approach to therapy. She recognizes the importance of mental health awareness among parents and teachers and therefore looks for an integration of all environments that the child is part of. Prerna has a keen interest in building emotionally safe communities for children which nurture worthiness and creative learning.